I made these after spotting the recipe in Food and Wine magazine last week. They became an instant classic in our house. 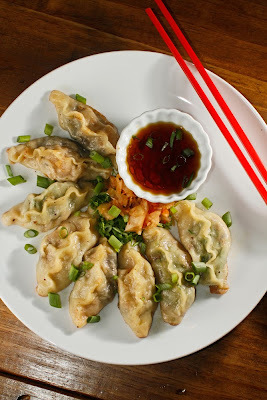 I know we will make these again and again because they are so easy and, as Gail would say, so tasty. I looked at the recipe and sort of followed what it said, but as you know if you follow this blog, I cannot follow a recipe to save my life. Luckily for you, the nice folks at Food and Wine have the recipe and a step-by-step slide show online; click HERE to see it. Sauté the ingredients together in a hot pan until most of the moisture has evaporated and the mushrooms are nice and brown. 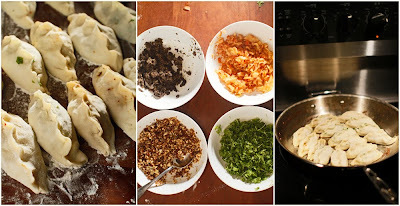 Stuff each dumpling with a small spoonful of the mushroom mixture and a pinch of chopped kimchi. Sauté ingredients together in a hot pan until most of the moisture has evaporated and the tofu is nice and brown. 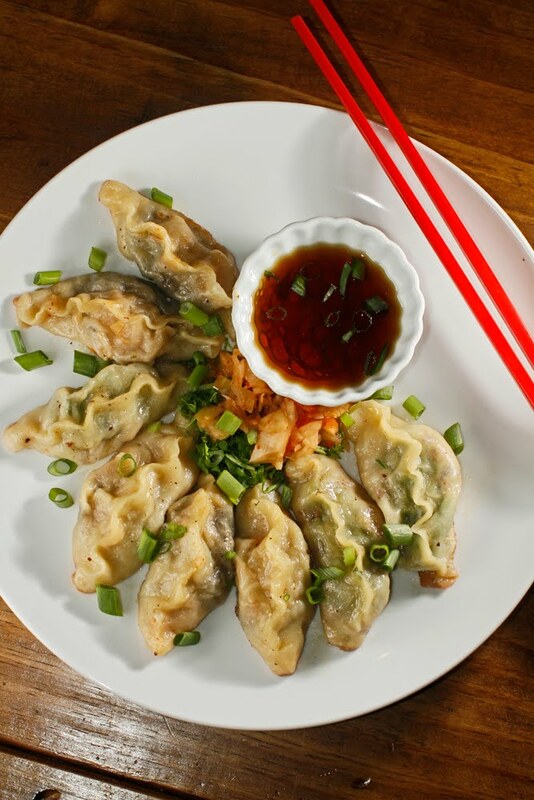 Stuff each dumpling with a small spoonful of the tofu mixture and a pinch of chopped fresh cress sprouts or watercress. I have gone head-to-head with both of these unusually large mushrooms and come out on top. 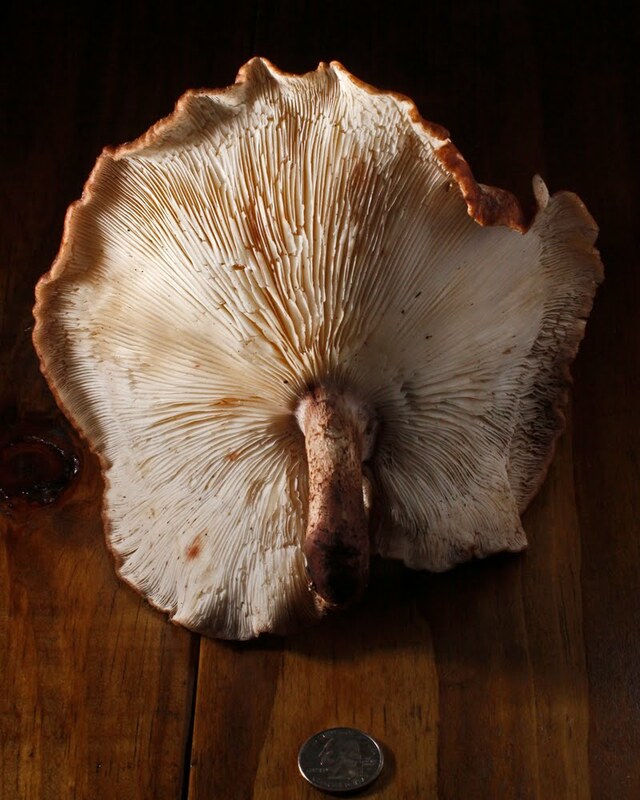 Tomorrow I go mushroom foraging with Matt Crone. 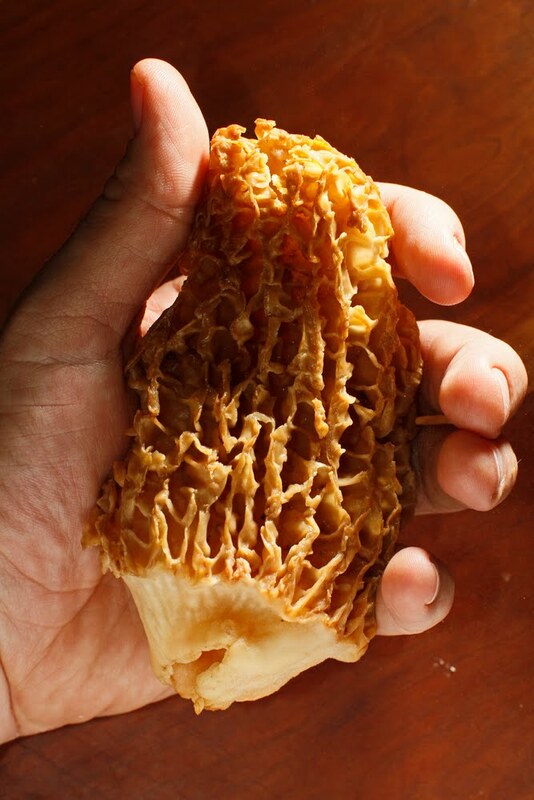 We are on the lookout for morels and chanterelles. Wish me luck. One of the best things about hanging out at estate sales nearly every weekend is going through the stacks of beloved vintage cookbooks. 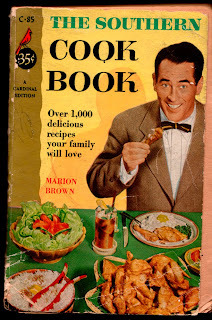 While today's bounty included a set of Russian nesting dolls, another day yielded Marion Brown's The Southern Cook Book, in which she says getting the "guarded recipes of the Southern household" proved most difficult. 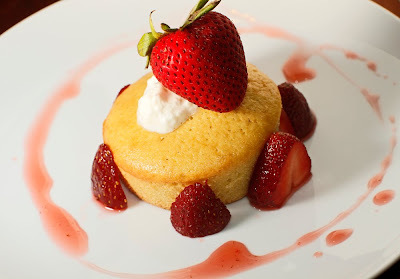 This plain vanilla cake is one of those well-kept secrets, and here it is for all of you. I needed a base for the strawberries I joyously overbought at market, and I needed something quick to make on a Sunday night. I made some adjustments (the duck eggs and the vanilla paste) to this 1951 recipe by a Mrs. Eugene Shaw of Raleigh, but I stuck to the recipe's straightforward and simple richness. Heat milk, but not to boiling. Add butter and wait a minute. Whisk them together in a bowl with sugar. Combine flour and baking powder. Separately, beat the eggs. Add dry and wet ingredients alternately, stirring after each. Add vanilla paste. Brush silicone muffin cups with canola and bake at 350 degrees for about 20 minutes or until slightly golden around edges. Let them cool and then add macerated strawberries and some cream. It's finally here! We rolled up to the first Memphis Farmers Market of the season at 7:20 a.m. yesterday, and to say it didn't disappoint would be a wild understatement. The vendors looked so happy to be back, and the crisp morning was the perfect backdrop. 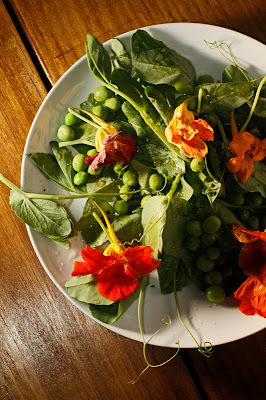 Strawberries from Jones Orchard were a major find, as were Van Cheeseman's pea tendrils...not to mention the hydroponic tomatoes from Micmak Farms and nasturtium flowers from the wonderful family at Dodson Farms. We made a salad with shelled peas, pea tendrils, and the flowers. I liked this easy dressing. All you need to do is whisk it all up together until it's emulsified and drizzle over salad. 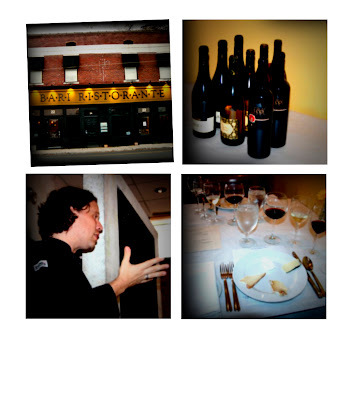 Tuesday evening April 20th at 6:30pm Bari is having its first-ever vegetarian wine dinner. Chef Jason Severs will be preparing 5 vegetarian courses that will be paired with 5 wines from Delta Wholesale. The cost of the dinner is $50. This is exactly the type of thing I love to support, so I will be there. I hope to see you there, too. The first meeting if the eaTABLE Supper Club was a success. If I said any more it'd be bragging, so I'll let Stacey tell you all about it. Click HERE to read the Fertile Ground review. Click HERE to read about the wine that Michael Hughes selected for the dinner. 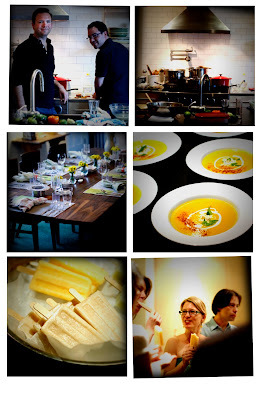 Also leave me a comment and let me know if you'd like to be involved in the eaTABLE Supper Club movement. a crunchy note and a pretty look to these recipes. We tried out some Meyer lemon and poppy seed shortbread cookies and a simple poppy seed dressing in order to resurrect poppy seeds from their mid-80's heyday and welcome them back to the plate. Preheat oven to 350 degrees. First, whisk the dry ingredients. Next, use hand mixer to combine softened butter and raw sugar until it looks creamy. Add egg, zest, and juice and blend on high. 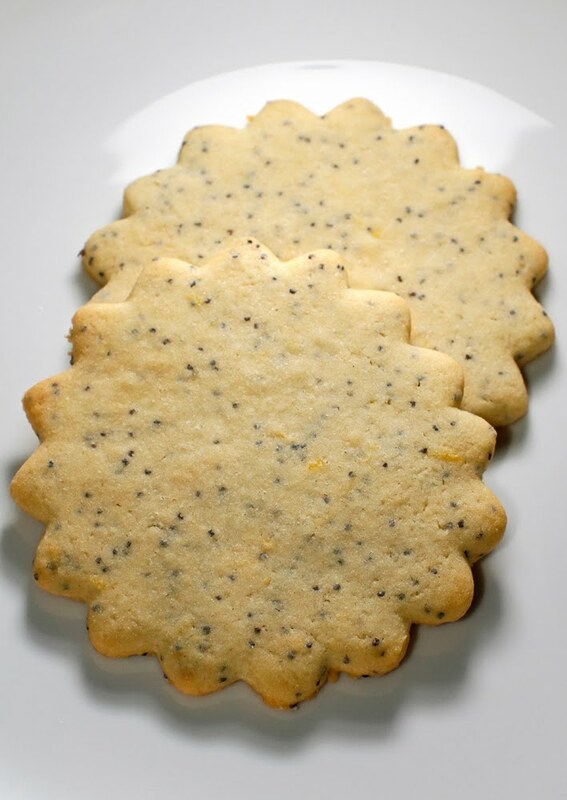 Fold in poppy seeds and dry ingredients. Make dough into a roll or patty and refrigerate for at least 2 hours. Then roll out dough with a little flour and cut circles with a cup or shapes with those hidden-away cutters you never seem to use. Bake at 350 for 10 min. or until edges are lightly browned. 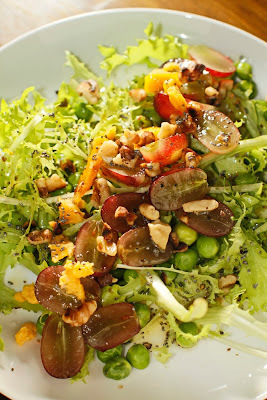 Whisk it up and drizzle it over anything green; we used frisée, shelled peas, grapes, Neal's Yard Shropshire blue cheese (! ), and toasted walnuts. We finally found pancakes that we both like! There's more to them than just flour and sugar, and the texture that the buckwheat adds is great. Mix dry, add wet, and stir until just blended. 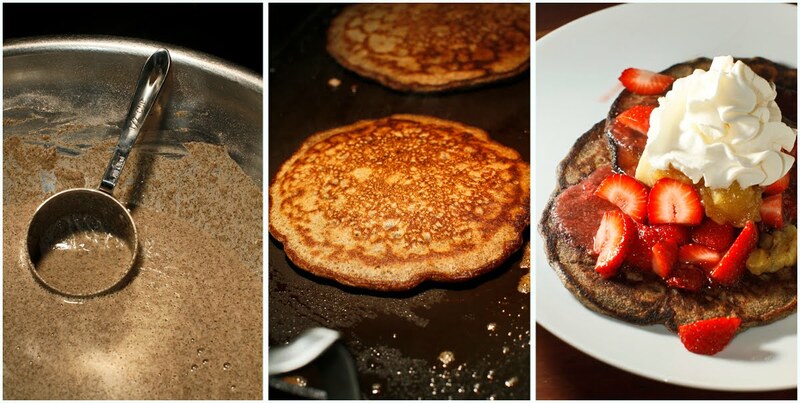 Add a little butter to a medium-low griddle, and use a 1/2 measuring cup to pour on batter. Wait until they've stopped bubbling and then flip. We added some warm cinnamony bananas, macerated strawberries, maple syrup, and brown sugar whipped cream. We stopped by Keith and Jill's new place, the Trolley Stop Market, last Saturday, and it's looking great! How exciting to look forward to all the fun stuff that's going to be happening there. Vendors will be there on Saturdays for a couple of weeks before the big reveal. While we were there, we picked up some sorrel, peach preserves, and one freakishly giant mushroom. Head downtown to 704 Madison tomorrow and show your support!